Situated within the Sierra Nevada between California and Nevada, Lake Tahoe is an idyllic alpine locale that provides visitors with the unique opportunity to experience the best of both a mountainside vacation and a trip to the beach. That’s right; you read that correctly! The shores of Lake Tahoe are perfectly suited to guests looking to escape the heat of a typical beach environment and spend their days along the shores of glittering Lake Tahoe. Here, popular activities like boating, fishing, jet skiing, kayaking, sightseeing cruises, and canoeing all allow visitors to achieve that perfect balance of excitement and relaxation during their vacation amongst the lush forests, striking mountain peaks, and sparkling lakes of the area. Step into these spacious luxury rentals in Lake Tahoe and you’ll immediately notice the openness of their layouts and the aesthetics of their design. Crossing over between traditional elegance and freshly modern, the ambiance of these vacation rentals in Lake Tahoe, CA are as sleek as they are warm and inviting. 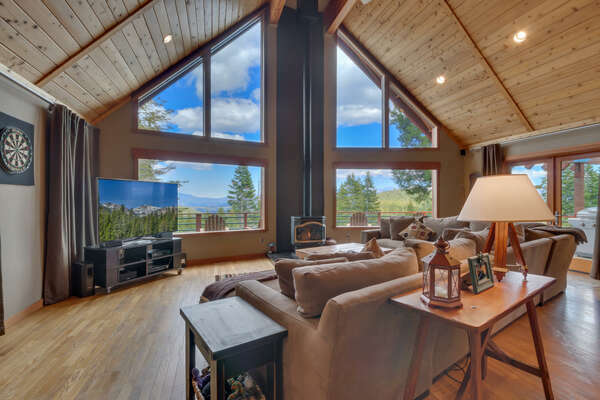 Revel in cozy details like stone fireplaces, plush furnishings, accents of knotty pine, and tasteful alpine décor as you lay back on the living room couch and catch a show or movie on the high-end flat screen television. Save a little bit of money while making memories with your guests in the full-sized gourmet kitchen, complete with granite countertops, stainless steel appliances, and an array of cookware. Take your meal at the classy formal dining table, at the convenient kitchen bar seating, or outside in the fresh mountain air and exquisite views visible from the sturdy outdoor deck. After long days spent enjoying leisurely strolls and water-based sports on Lake Tahoe, you can retreat to the privacy and comfort of individual bedrooms with soft beds and resort-style bathrooms. Contact our team of reservation specialists to learn more about what Lake Tahoe has in-store for you when you reserve your stay in one of the fantastic vacation rentals in Lake Tahoe California that Tahoe Signature Properties has available today!